A bad witch's blog: Question: Would You Stick Pins in a Tyrant's Effigy? Question: Would You Stick Pins in a Tyrant's Effigy? 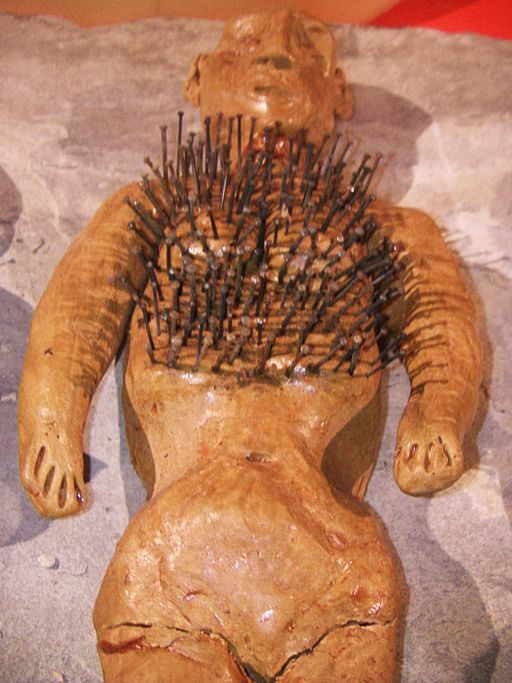 The practice of sticking pins in dolls or effigies of others in order to cause them suffering by means of sympathetic magic is ancient. In England, such magical dolls were traditionally called poppets. They were often made to look as much like the person in question as possible, or contained something to connect them to the person - perhaps a lock of their hair or their photograph. Poppets can be used for healing as well as for hurt, but they are probably best known as curse items. During WW2, pin cushions were made in the likeness of Hitler, and many of those sewing to "make do and mend" would have happily stuck a pin into the Nazi dictator's bottom and wished him ill. However, many modern pagans believe that it is unethical or counterproductive to use magic for harm under any circumstances. My question is this - would you stick a pin in a tyrant's effigy? 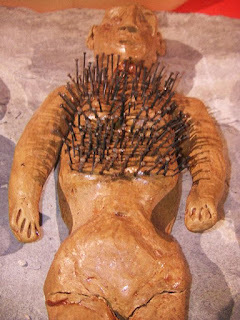 The picture is by Midnightblueowl and shows a figurine of a human with pins stuck in it. From the Museum of Witchcraft, Boscastle. It is shared under Creative Commons via Wikipedia. of course,,,i have done this in the past(stuck pins in an effergy) and let me tell you,,thats some powerful magik! Hell yeah! I actually have a poppet in the works! Working on ones with Trump's likeness right now! I like President Trump He makes libtards cry. And You think wishing to harm the US president By sticking pins in a poppet gives You the moral high ground? What happen to 'and it harm none'? Have you made poppets of the terrorists who want to murder UK citizens? or the dozens of abusers preying on children in Oxford, Telford and Rotherham Or the rioters Who in 2011 burned peoples homes and businesses to the ground? The blog post is just a question, and does not mention any living people. It mentions pin cushions that looked like Hitler that were used during the war. All responses are interesting in terms of belief and folklore. I saw a Hiltler pin cushion at the Museum of Witchcraft and Magic in Cornwall.